The Florida Regional office of Whole Foods Market engaged Michael Singer Studio to study alternatives to the dull, disorienting and formulaic shopping center developments found throughout most of Florida. The challenge put forth was to demonstrate how a shopping center could be distinctive, environmentally considerate and socially dynamic. 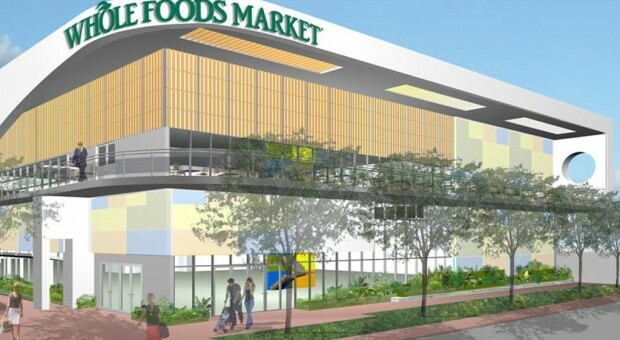 Whole Foods Market found that as a highly desirable anchor tenant they could ask shopping center developers to include public spaces and a range of aesthetic and environmental enhancements that would otherwise be rejected if requested by other tenants. Suddenly Whole Foods Market was in a position where they could drive a rethinking of how a shopping center could become a real place within our communities. The Studio’s initial work studied the development guidelines presented by various development companies and essentially re-wrote the guidelines to promote a more environmentally conscious approach. The plan was to challenge the developers to think differently and raise the standards and expectations for new development. The next step was to create an entirely new set of guidelines for the developers. Working closely with Whole Foods Market the Studio created Outside the Box: Whole Foods Market Alternative Site Planning and Environmental Design. The focus of the document is on the design of the building shell as well as the interaction between the building and its site, landscape, public space, circulation, aesthetic considerations, environmental systems, energy conservation, and community programs. The document not only presented a range of concepts, it also put forth 3 levels of cost that could be considered and provided a menu of potential selections for the developers to consider in their planning. The document was then provided upfront to development teams seeking to work with Whole Foods Market anywhere in the state of Florida. The document was also presented at the national level of Whole Foods Market. The guidelines were utilized for designs in at least 6 locations in Florida: Miami Beach, Naples, Pembroke Pines, Orlando, Jacksonville and Boca Raton. Whole Foods Market also engaged Michael Singer Studio to develop site specific guidelines for each of these Market locations and in the case of Jacksonville to design the entire building shell and exterior. The Studio also had a major design role on the Orlando Market building shell and landscape as well as the exterior gardens at the Boca Raton Market. Jeff Walker and H. Todd Lackey at Oest Associates Inc.